Prairie dogs are fun animals to photograph at the zoo. There's always a bunch of kids around getting super excited about them and they are rarely still for more than a few seconds. 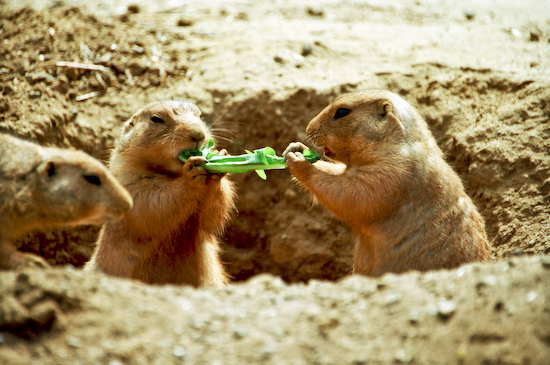 In this photo, I took a shot of two (and half a second later - three) prairie dogs fighting over a piece of lettuce. Had I had the presence of mind to zoom out a little, it would have been revealed that the prairie dogs were fighting over their meal when there was an entire bowl of lettuce just two inches to the right of the frame. Since the infinite lettuce supply was right next to them, I figured they were just rough housing (although from the yipping and scrabbling that I saw it looked fairly violent). Later, when I looked through my shots, I realized that in the moments that I had captured, the prairie dogs looked like they were peacefully sharing food. So, I called the photo "Sharing" and that was that. Now you all know the real story.